Portland heads to the Big Easy to face off against the Pelicans for the second time this month after earning a 110-107 victory in Portland on December 21st. After beating the Clippers in a hard fought game in overtime this past Thursday, the Blazers moved their record to 24-6 on the season after a 108-107 loss to the Miami Heat on Saturday. It was a wasted chance for Portland who faced the Heat without superstar and reigning-MVP LeBron James, who was out with injury. Despite winning two out of their last three games, the Trailblazers defense has fallen over the past month. They are allowing nearly 112 points over the last four games which is more than ten points higher than their season average. New Orleans has an excellent offense and should be able to take advantage of the Trailblazers recent poor defense. 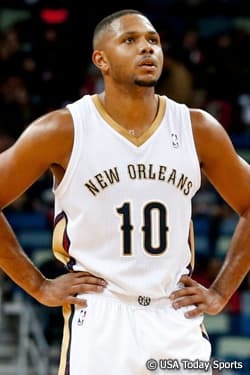 Though, they will likely be without starting shooting guard Eric Gordon who will likely be out tonight due to a hip contusion. The Pelicans have been shooting the rock extremely well their past four games, scoring nearly 106 points per game on average. However, it was not enough at Houston on Saturday as New Orleans blew a late lead to win 107-98. The loss dropped them to two games under .500 for the season at 13-15. I think the Pelicans have an excellent chance to score the upset in this game. They are quite as proficient on offense as Portland, but they can hang with most teams in the league offensively. Their interior defense should do a decent job on LaMarcus Aldridge. New Orleans hangs their hat on effort and hustling and are well rested tonight to put up a strong performance on both ends of the floor. As the Wizards head to Detroit on Monday night, both teams need some help on the defensive end if they want to improve their season and have a chance at the NBA playoffs. Detroit has lost four out of their last five games as they look to end their recent skid at the Palace of Auburn Hills. At 14-18, the Pistons have played poorly the last few weeks and at home, going just 6-10 on their home floor this season. They welcome the Wizards on the second leg of a home at home. Washington won 106-82 against the Pistons on Saturday in D.C. while shooting lights out. They were 9-19 from three-point range and shot 50 percent in the win. Washington’s improvement from last season has been dramatic, especially with their early season injury woes. They are just one game under .500 currently at 13-14. Both woeful defensively, these two teams should be trading baskets all night long. This total could easily be in the 205 or more range, and I would still be interested. The Pistons have a nice matchup inside while the Wizards should be able to shoot the ball well from outside against Detroit’s terrible perimeter defense. Both teams should be over 100 points before you know it.